While the stereotypical image of the farmer may be a ruddy-faced son of toil and soil, in Latvia "he" is very nearly as likely to be a "she", according to data published by Eurostat January 14. Latvia and southern neighbor Lithuania lead the European Union in the proportion of farm managers who are women. Both have 45% female farm managers, topping the table. Romania (34%) and Estonia (33%) are in third and fourth places, giving the Baltic states three of the top four rankings, based on data from 2016. Of 69,930 Latvian farms, 38,540 are listed as being run by men while 31,400 are run by women. The previous data set from 2013 showed 36,940 (45%) of a total 81,800 farms run by women, so despite a drop in the total number of farms, the proportion of women runnign them has remained stable. 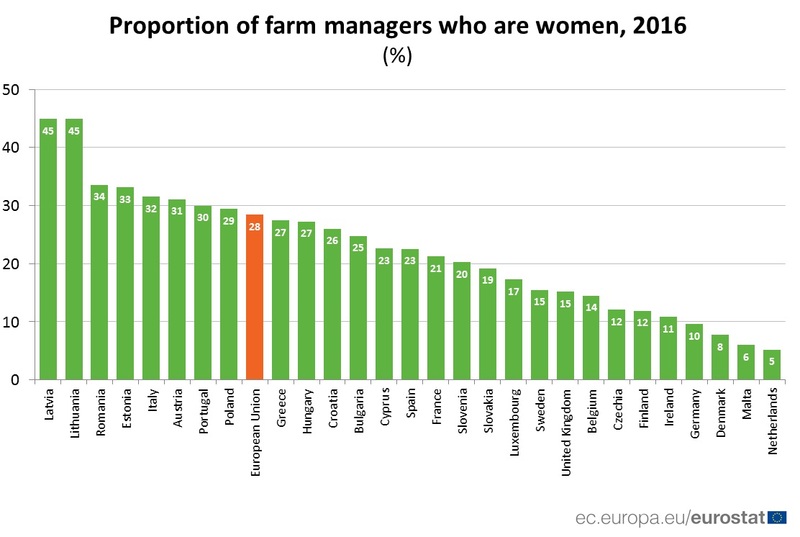 Perhaps surprisingly, at the other end of the scale is a country with a progressive reputation on gender issues, namely, the Netherlands, where just 5% of farm managers are women. Denmark and Malta also have single-digit percentages. The European Union average figure is 28%. You can read more recent data on the EU's agricultural sector in this substantial report.